Welcome to Hue Home Lighting. The site was set up by myself, Mike, after I started to install smart lights and wanted a place to see what others had done, guides to apps to use and how to set them timers and routines. After changing bulbs over in my home and using a whole range of apps I decided create a place for other people like me that have the bug too. As you can see from the image above it shows just a few of the boxes I have left from my Hue bulbs. I have a bit of a thing for the light strips and slowly but surely all rooms are becoming lit with Hue. 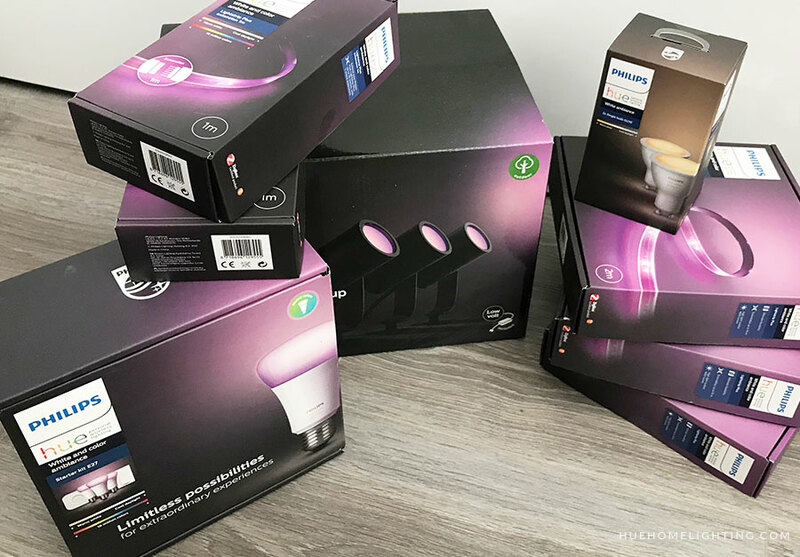 I love seeing what others have done and love sharing guides and reviews on different apps and Hue products, I cannot wait too see what is next for smart bulbs and new features that will come. I aim to share the latest news, reviews and guides for all things Hue. If you would like to share your set up, or have some tips or guides you want to share then drop me a message below. Also if you have any questions regarding Hue then do share on our forum or do drop me a message and I will try and help. If you wish to contact us please use the form below. We welcome guest posts related to your new apps or home lighting news, if you wish to contribute please do get in touch. Amazon Affiliate Notice of Disclosure: We would like you to note that this site (https://huehomelighting.com) is a participant in the Amazon EU Associates Programme, an affiliate advertising programme designed to provide a means for sites to earn advertising fees by advertising and linking to Amazon.co.uk. We are not related to Philips in any way. We cannot answer questions about warranty or other direct issues with your system. This is a fan and guide site which aims to round up popular apps, clever designs and uses of the hue and looking at fantastic apps that will take your lighting system to the next level.